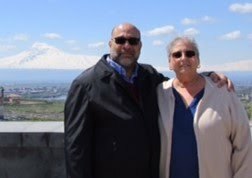 When my husband Doug, friends Bonnie and David, and I attended St. Mary Armenian Church Food and Music Fest in April, we feasted on some pretty tasty food. One of the highlights of our meal was the lule kebab – tender, juicy, and delicious. We heard through the grapevine that the recipe prepared for the festival was a specialty of St. Mary parish priest, Father Vartan Joulfayan. Impressive, I must say! If you’ve been following our website, you know that we’re fans of lule kebab, especially if it’s made with good quality ground lamb- and - just as there are numerous recipes (and spellings) for other Armenian foods, lule kebab is no exception. See our own recipe for lule kebab. 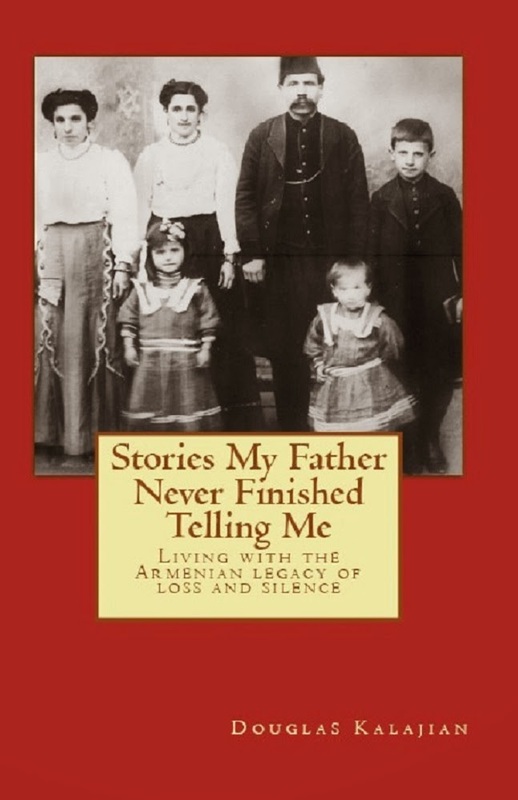 Since I’m always searching for recipes – new and old – I asked Father Vartan if he would share his lule kebab recipe with The Armenian Kitchen. Happily, and without hesitation, he did so. Thank you, Father Vartan! As soon as I received his version, it was clear that I had to make it. My dinner guests would certainly include Bonnie and David, who eagerly accepted our invitation for a very special Memorial Day meal. 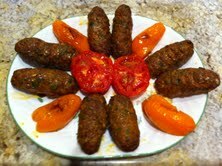 Father Vartan's lule kebab recipe as prepared by The Armenian Kitchen. 1. Place the cut onion and 2 cloves of garlic in a food processor. 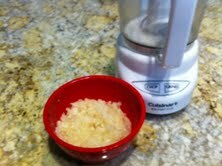 Process until onion and garlic are very finely chopped. Special Note: DO NOT discard the juice extracted from the onion and garlic; it will be added to the meat mixture. 2. 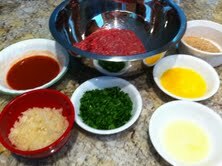 Place the meat into a large mixing bowl. Add the processed onion and garlic – along with their liquid - to the meat. 3. Add the remaining ingredients to the meat, mixing well by hand. 4. Using a ½ cup measure, make 12 balls. 5. Roll them into the traditional Lule (sausage-like) shape and grill. NOTE from Father Vartan: It can be accompanied by the "Lion's Milk/Raky." We intended to grill our lule kebabs on our outdoor electric George Foreman grill - unfortunately, we don't own a gas grill - until a thunder and lightning, rain-filled mini storm raged through the area. It only lasted about 20 minutes, but it was enough to prevent us from cooking outside. Thankfully, we didn't lose electricity, and decided oven-baking was the way to go. I placed the kebabs on a roasting rack which sat over a foil-lined baking pan, and baked the lule kebabs for about 35 minutes, turning them after about 20 minutes, at 375°F. 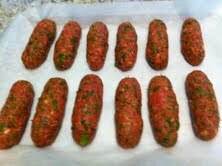 Our kebabs turned out just as plump, tender, and juicy as we remembered them at the Food Fest. Our guests – and we - enjoyed the flavor and texture as well. The addition of bread crumbs, egg, tomato sauce, and liquidy onions accounted for the tender consistency of the kebabs. The accompaniments – fresh parsley and onions, along with roasted peppers and tomatoes (the oven was already on, so I roasted the veggies in there, too), Armenian-style potato and egg salad, and locally grown corn- on- the- cob elevated the meal into a holiday feast. Grilling would have enhanced the taste even more, but safety first! For dessert: watermelon and Armenian coffee.............. delicious! These were SO good. I recommend the recipe, in fact I recommend the whole menu! Better yet, get yourself invited to feast the *real* Armenian Kitchen; you can't beat it. Aw, shucks... you're making me blush! Thank you for joining us, supplying the watermelon, and for your encouraging words. BUT, none of that meal would have been possible without Father Vartan's recipe - so thanks again, Father Vartan! Thank you Der Hayr, Doug and Robyn. I broiled it in the oven, Fabulous recipe. Khosroff and I loved it. I tried this recipe for the heck of and have to say I was not impressed with the end result. I cooked mine with turkey meat on wood charcoal and although the meat charred none of the juices ran out. I suspect this is because of the bread crumbs. Thinking back on it I believe that eggs, breadcrumbs and oregano are 3 things that do not belong in lule kebab. Shakuey, I suspect the problem has more to do with the fact that you used turkey, which is lower in fat than ground beef or lamb. Try increasing the amount of tomato sauce from the recipe and use a little vegetable oil (or lard or chicken fat :-). You definitely need the breadcrumbs and the egg to help the kebab stick together (especially since it is turkey). NOTES: 1) This is off the top of my head, so caveat emptor. 2) I'm not sure about the lemon; it may make the yogurt curdle. 3) Add a couple of tbsps vegetable oil to the meat first and feel with your fingers. If you can feel the oil and the meat has a slight sheen, then it's enough. Otherwise, add a little more but no more than 1/4 cup. Ara, I actually did not use a particularly lean turkey for this recipe. I have used even leaner cuts of all beef and juice always comes out of the meat when making lule (or as well call it kefta) kebab. I just didn't care all that much for the recipe, I usually make this type of kebab with simply chopped parsley, diced onion, diced pepper, all spice, Aleppo pepper, a touch of cumin, a touch of corriander and salt and I am good to go. I have never heard of egg in this type of dish and would not use it again. Just a tip, sometimes this type of kebab has a hard time sticking and the main culprit is wet ingredients (parsley, onion, pepper). The key to this is to make sure they are dry as possible, I usually let them soak on paper towels. If you are using a fresh cut of meat there should be no problem binding your kebabs. I prefer doing this around a kebab stick but that just might be me being old fashioned. However, I put them straight on the grill, whereas my parents would have left them formed on the stick and put them directly onto the barbecue. Please email me at: robyn@thearmeniankitchen.com. I'd like to know more. Thanks! 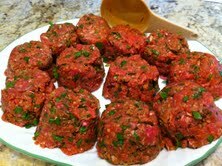 Well I intend to use the first recipe from Memorial day at the Armenian camp upstate, NY. It seems wonderful and the mix looks perfect. father, bring it on. I am looking forward to it. Stay tuned!! !